On a peninsula surrounded by Savusavu Bay to the northwest and the Koro Sea to the south, you will find, amongst the palm trees of an old copra plantation, one of the world’s most unique destinations – Jean Michel Cousteau Fiji Island Resort. Well-appointed accommodations range from charming garden bures to the luxurious “villa”, one of Fiji’s most sought-after places to stay. Gourmet meals, abundant activities, a romantic atmosphere that is second to none, and of course the Fijian staff, will make your holiday a truly wonderful experience. Built on the site of a former coconut plantation, the 17-acre resort features 25 spacious bures. 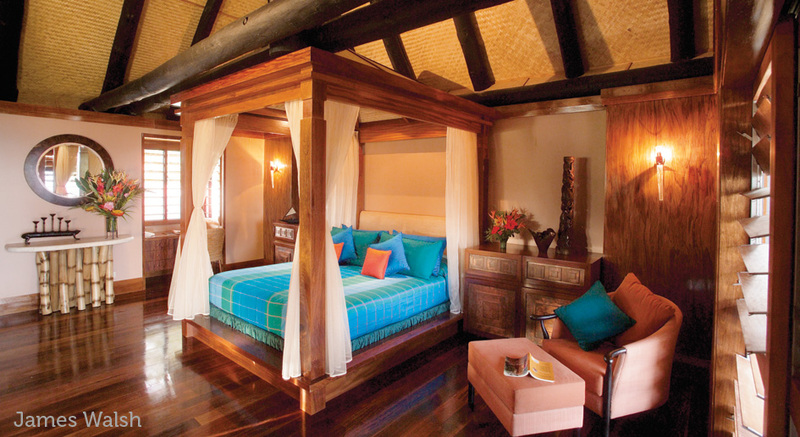 Built of local timbers, these traditional thatched Fijian bungalows provide privacy, comfort and personalized service. Each bure features rattan furnishings, king-size bed with custom-made mattress, small sitting area with desk, wooden louvered windows, overhead fan, and private deck with garden or ocean views. Oversized bathrooms in warm Italian tile offer double sink basins, separate shower, and hair dryer. Other amenities include minibar with complimentary beverages and snacks, French press coffee maker, plush robes and tropical flowers. To ensure a serene environment, the bures have no telephones or televisions. Room rates include all meals, non-alcoholic bottled beverages, and ground transfers to and from Savusavu Airport. Daily meals feature a full cooked or continental breakfast with fresh-baked pastries, tropical fruits, fresh seafood or eggs any style. For lunch and dinner, a daily table d’hote menu offers international cuisine selections and a healthy, vegetarian option. Have An Authentic Fijian Beach Ceremony… At this lovely resort, many weddings take place on a private expanse of beachfront at sunset. It is customary for two Fijian Warriors to carry the bride up the beach to her groom. The procession is accompanied by the blowing of conch shells and beating of Lali drums. Fragrant tropical flowers add to the joyful ambience. Magnificent salusalus are made for both the bride and groom. Similar to Hawaiian leis, these flower necklaces are made of native flowers, tapa cloth and leaves. In addition, an exquisite bouquet for the bride and a boutonniere for the groom are provided. After the ceremony, the newlyweds celebrate their nuptials at a specially prepared gourmet dinner. This private affair is held on the beachfront pier, enhanced by Champagne and candlelight. The pastry chef prepares a special wedding cake for the occasion. Jean-Michel Cousteau Fiji Islands Resort offers an exceptional range of cultural, educational, environmental and recreational experiences. Many activities are enjoyable for all guests, and some are of special interest to romantic couples, children or water enthusiasts. On land, there are local village excursions, rain forest hikes to waterfalls, mangrove adventures, reef flat walks, basket weaving and Fijian story telling narrated by a local Fijian Cultural Host. This resort is also the only property in Fiji that has a full-time, resident marine biologist, who is on hand to explain the island’s flora, fauna and sea life. Sports enthusiasts can play tennis on the court set among the gardens, or join the staff in a game of volleyball (but be warned they rarely lose!). Or clear your mind and relax your body with a morning yoga class. In the Water refresh your mind and body with laps in the freshwater swimming pool just steps from the ocean. Explore the local clam project by snorkeling off the jetty, or take the glass bottom boat to snorkel on the outer reefs accompanied by the Marine Biologist to explain the area’s extraordinary diversity. Or dive in to scuba — the L’Aventure team offers a full range of dive opportunities and experiences, from beginner to expert level. Sail a Hobie Cat over crystal clear waters, skim the reef by kayak, or discover the astonishing sea life from the comfort of the glass bottom boat. Take a fishing trip around Savusavu, and bring your catch back to the Chef who will prepare it as you wish for dinner! Experience Fijian music, kava ceremonies, traditional medicines and the neighboring village. Come learn about the gracious culture that is at the core of legendary Fijian hospitality. Relax completely and rejuvenate your mind, body and spirit at the South Pacific’s most comprehensive spa facility. Fijian massages and over 20 spa treatments are featured. Prices very depending upon season and duration of your stay. Please contact us for specific pricing.